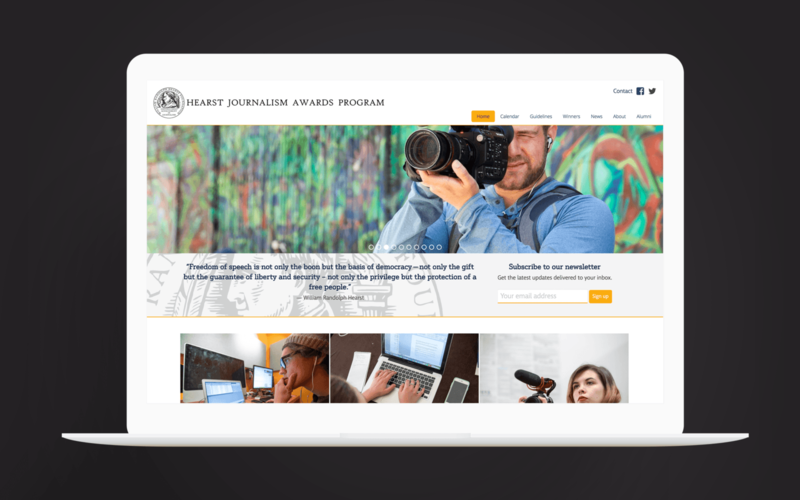 The Hearst Journalism Awards Program was founded in 1960 to provide support, encouragement, and assistance to journalism education at the college and university level. The program awards scholarships to students for outstanding performance in college-level journalism, with matching grants to the students’ schools. The program consists of five monthly writing competitions, two photojournalism competitions, one radio competition, two television competitions, and four multimedia competitions – with championship finals in all divisions. The website, hearstawards.org, required a responsive redesign and architecture update, as much of the collegiate target audience was viewing the site from mobile and tablet devices. The site’s audio and visual assets’ legacy formats needed conversion to become mobile-friendly. The site needed to be easy for staff at Hearst to maintain, and the look-and-feel needed a visual update to appeal to the site’s core audience of college students, while maintaining the historical aspects of the Hearst brand. The original Hearst site before the redesign. After identifying site requirements, initial wireframes were developed for the homepage, competition landing pages and individual closeup pages, and iterated to advance towards a prototype, Using a responsive framework and WordPress, a prototype was constructed to test navigation and flow. Needing to strike a delicate balance between the history of the Hearst Brand and a youthful audience for the site, several palettes and typefaces were layered in for consideration, initially in static composites and then later worked in with the prototype. Selected initial palette and typography explorations. Homepage and subpage template approved palette and typography. The site was launched in coordination with a social media campaign on Facebook and Twitter and received positive reviews the look-and-feel and responsive design. The site has seen a steady increase in traffic since launch, and ease of updates enable the site to keep content fresh on a monthly basis.